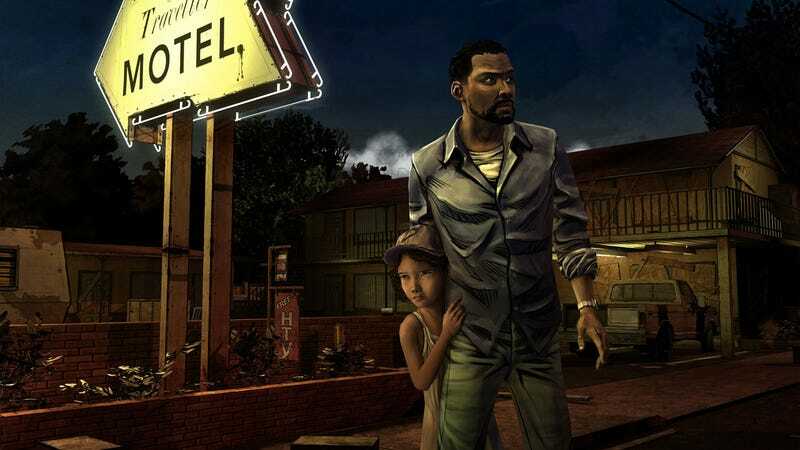 Telltale Games, the creators of the episodic video game series based on Robert Kirkman's comic book The Walking Dead, have but one screen shot to spare of their upcoming PC and console title. But one screen shot will do perfectly fine. The folks at Telltale are bringing an ink and watercolor aesthetic to the The Walking Dead game that they say strives to match the visual style of comic artist Charlie Adlard. The 3D adventure game will feature a distinctively loose concept art approach, with textures designed with ink lines and watercolor streaks in mind. The above screen from The Walking Dead gives us a peek at the game's main character, Lee, an Atlanta man who is en route to a Georgia prison when the zombie apocalypse begins to spread. Things obviously don't go as planned during his prison transport and eventually he teams up with a young girl who has lost her family to the undead. Telltale says The Walking Dead episodic game series will be unlike most zombie video game fare, a game that is a more personal story built on narrative, but not moral, choices. They talked about an adventure game stuffed with moment-to-moment micro-choices, a game more experiential than your typical horror game. Telltale Games expects to have more to show of The Walking Dead by this year's New York Comic Con.